Blending water-color and using salt. Working with watercolor. Using lines to make patterns for bridge. Dotters for green bushes on left side. iridescent sprinkles for sky if you have time. large brushes for painting water and sky. If you wipe brush off you can use same brush for sky. Start by showing the students real pictures of the Golden Gate Bridge and discuss some history. My favorite question is asking them what color it is no will guess International Orange. First start with black oil pastels to make the wires on the bridge cutout and city scape background (buildings on right side and bush or greenery on left). I show them how to do the pattern on the white board first and if they make a mistake on one side of the bridge cut out they can turn over and use the other. The buildings are easy and we do shapes such as rectangles to show the large office buildings on the right side of the bridge. Be sure they place them a little above their horizon line so they don’t get covered by the bridge. Next apply blue watercolor at your horizon line and paint the sea. Then use green watercolor to add a touch of green to the ocean color. Next use salt to create waves and white caps. The watercolor must be wet on the paper in order for the salt to work. Then use turquoise tempera to paint the sky trying to be careful not to paint the buildings. If you have time let the students add iridescent sparkles to the freshly painted sky and it should stick. There is glue in tempera paint the students always like knowing these kind of facts. You can also use a paper towel to wipe the turquoise tempera away from the oil pastel buildings either way they look good. Set large background piece aside to work on bridge cutout. 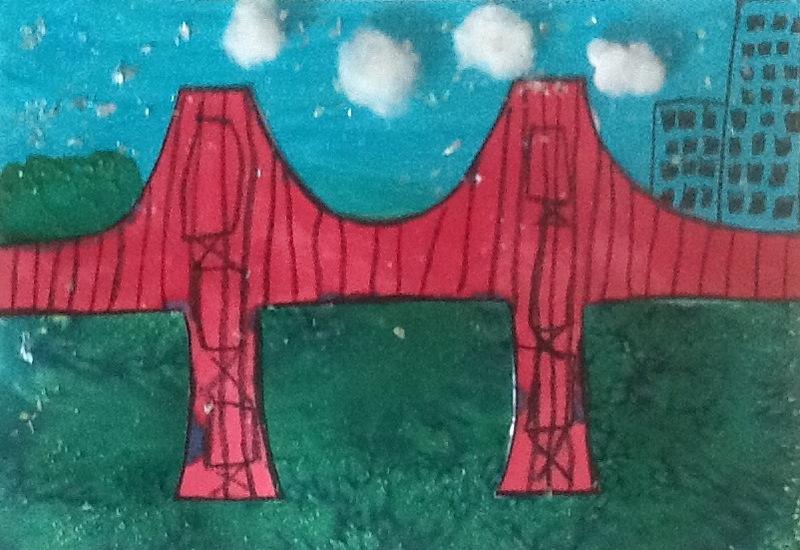 Paint the bridge red with the watercolor and then work on making your clouds out of batting pieces. I show the students how to gently pull the batting apart to make wispy clouds. Then go back to the background and add a hint of green tempera for trees/greenery on left side with dotter. Then glue down bridge and clouds to complete your masterpiece.